This week, I made this card for a friends birthday. I used a stamp from "little claires"
and coloured them with my promarkers. and I added some Martha Stewart punched butterflies. So soft and pretty! I always think of these colors as baby pastels and your use of them is delightful! Thanks for sharing with us at 613 Avenue Create! Very pretty card Vic. Your flowers are so delicate, great colouring. Thank you for sharing your work with all of us at Crafty Boots Challenges. Beautiful pastel shades on this stunning card work so perfectly to create a soft subtle effect. Glad you joined in the fun this week at I love Promarkers this week. 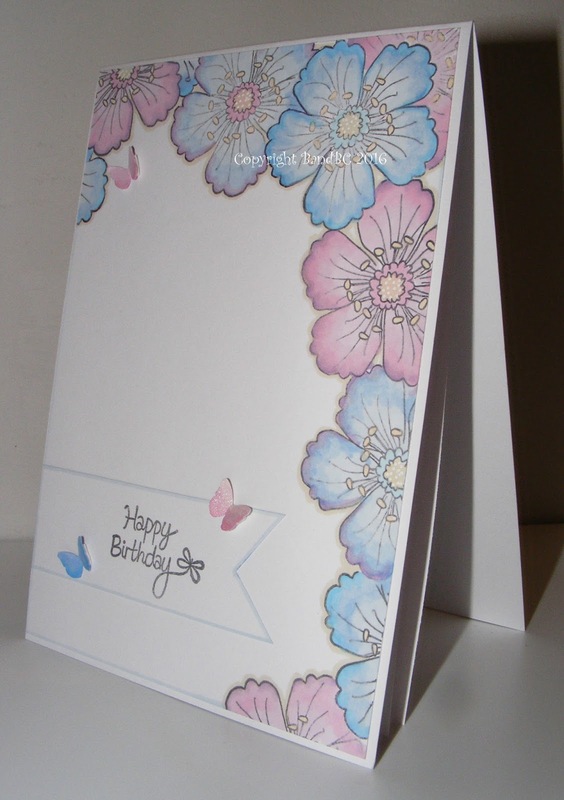 Beautiful soft colours on your delightful CAS card. Thanks for sharing with us at 613 Avenue Create. Hope to see you again. Your card is so pretty, Vic! Lovely colouring of all those flowers! Beautiful pastel tones, fab design. Thanks for joining us for the ATG challenge at Digi Choosday. A beautiful design, gorgeous flowers! Gorgeous card!! Thanks so much for participating in our LEMON SHORTBREAD challenge!!! Can’t wait to see you participate again in our next challenge!! Have a great crafty day!! !